At Venkataeswara Hospitals, your health is our passion! Meet our specialists for holistic, sustainable long-term care. Venkataeswara Hospitals, a leading multispeciality hospital, is located in the heart of the city at Chamiers Road, Nandanam, Chennai, standing very close to the main arterial road of Mount Road (Anna Salai). We provide specialised and general medical services with professionalism, competence and a caring touch. With a modern clinic managed by qualified and experienced doctors, Venkataeswara Hospitals works to offer the very best in preventative and curative healthcare. We utilise the latest in medical technology to ensure our patients receive accurate diagnoses. We have received the ISO 9001:2008 certification for quality. At Venkataeswara Hospitals, we are committed to providing preventive healthcare. After all, prevention of disease is the best way to building a healthy society. We offer comprehensive health checkups that will help you get started on your journey to good health. Our top priority is the care of our patients. That's why, at Venkataeswara Hospitals, we have invested in the best possible laboratory equipment. 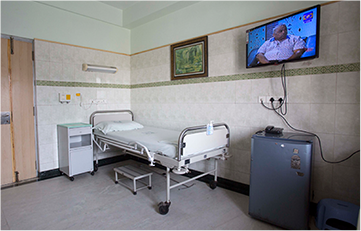 We aim to offer the best possible preventive and curative care. With the best in laboratory and imaging equipment, and a team of highly qualified doctors, Venkataeswara Hospitals prioritises accurate diagnosis and provision of treatment information in a timely and compassionate manner to patients and their caregivers. We are what we eat! Dietary planning and restriction is one of the most important parts of holistic healthcare. 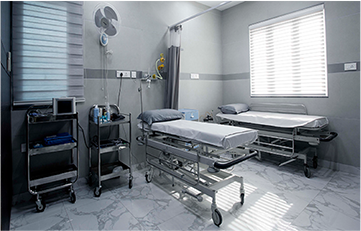 Our team of experienced healthcare providers also shares dietetic advice and post-hospitalisation diet plans, as well as providing dietary care during inpatient hospitalisation, as required. 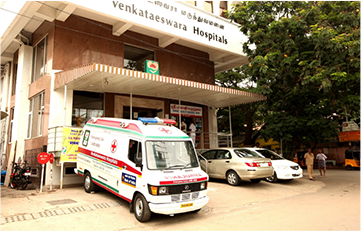 Venkataeswara Hospitals is an ISO 9001:2008 certified organisation. We offer high-quality care and service to all our patients, supported by strong infrastructure and a galaxy of eminent academic and medical specialists. Our Imaging Department provides a wide range of medical imaging types and modalities. While most imaging is conducted during regular office hours, we ensure that care beyond hours is not restricted. Special attention is given to on-call emergencies as well. Our ambulances carry oxygen therapy equipment with defibrillators to provide immediate aid in the event of any deterioration in the health of patients while in our care.